Baby Proofing in Phoenix Arizona has never been easier. Baby Safe Homes offers complete childproofing tailored to your needs. 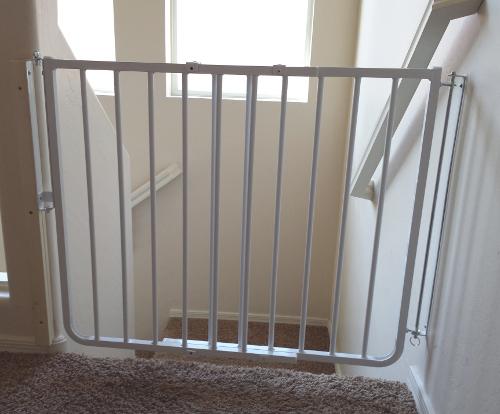 Here is a recent installation of a custom baby gate for a client that did not want any holes drilled into her stair banister posts. 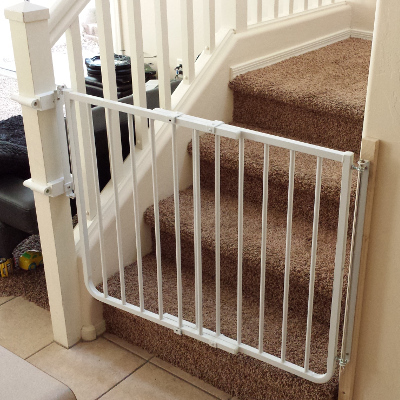 Our professional babyproofer in Phoenix installed a no holes banister kit then attached all the gate hardware to the kit eliminating any holes in the stair banister. At the top of the stairs we did a nice clean install with a custom mount on the catch (left side) to the facing wall so the gate could be installed straight across and not at an angle. The baby gates can easily be operated with one hand. They are all metal with no plastic pieces that can break or fail like most gates available in local retail stores. If you need help with baby proofing your home or need a custom baby safety gate installed on your stairs, please contact your local Baby Safe Homes child safety specialist. We are here to help, advise and install.